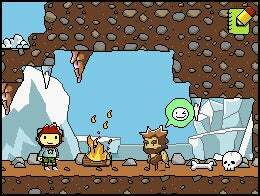 They're not exactly squeezing Little Big Planet into DS game Scribblenauts, but the potential for some interesting building, creating and sharing is there. When I asked earlier this week about any multiplayer options in this fall's will-render-whatever-you-write game Scribblenauts, I got a surprise response. The game won't have any standard multiplayer, but it will allow players to edit and share levels. The player who edits their level is ultimately creating an obstacle course for whoever plays that level once it is shared from DS to DS. The goal, as in the pre-made stages of the game, will be to collect a star. But what will stand in their way, and how the shared world will behave, will be a surprise, courtesy of someone else. Players start with pre-made terrain. They can write whatever they want into the game — as is standard with Scribblenauts — and it will appear. Writing a second thing into the level produces the opportunity to define the relationship between the two things that the level-creating player has put on the screen. So if you've written a bear and some honey into the game world, the bear can be made to fear honey instead of craving it. The producer demonstrating the game to me showed me a simple word-balloon-style menu that has these relationships listed in it. Pick the one you want and that will be the law in that level. Bear in mind that the developers of the game are striving to have every kid-friendly non-proper concrete noun represented in the game by an associated object. So the possibilities of what kind of ecosystem a player might inject into the level are myriad. I might put a swarm of bees into my level that only fear unicorns. You might create firefighters who are attracted to whales. Or, as seems to be the case of so much of this game, things could get weird. That's guaranteed. Scribblenauts is out for the DS this fall from developer 5th Cell and publisher Warner Brothers Interactive Entertainment.